San Shou Kuan, Judo, Karate, Olympic Freestyle Wrestling and Thai Boxing are amongst the list of timetabled Martial Arts classes. Some of these classes take place at lunch time so why not join us then. A method of self-defence without weapons that was developed in China and Japan; holds and blows are supplemented by clever use of the attacker's own weight and strength. Excercise Benefits : Improves and maintains both strength and stamina. Vernon began training in Brazilian jiu jitsu at 15 years old and has been teaching since the age of 16. Winning gold competing at blue, purple and brown belt. After receiving his brown belt from Roger Gracie at 19, he began focussing on boxing and MMA training. Always on the mat improving his skills and furthering his knowledge, he received his black belt from Roger Gracie at 25. With 15 years of experience training and teaching in the art Vernon has trained with the very best athletes from around the world and knows what it takes to learn and improve in the sport, believing it better to do one technique well than 10 techniques poorly. Vernon takes the Thursday class. A rapidly growing grappling sport and widely considered as the most complete martial arts for ground fighting, Brazilian Jiu Jitsu is derived from a combination of traditional jiu jitsu, judo, and wrestling, with a focus on positional control and submissions attained using leverage and technique. Predominantly focusing on grappling on the ground without the use of strikes, BJJ emphasises the use of leverage, speed and technical application over strength and power  enabling a smaller person to control and submit a much larger opponent. A typical class consists of functional warm ups, some takedowns, positional technique repetition or drilling and controlled sparring, referred to as rolling. BJJ is both a highly effective martial art for self defense as well as a fun, technical and challenging combat sport. Excercise Benefits : Rapidly builds fitness, mobility, flexibility and confidence. Simon started Brazilian Jiu Jistu training in 2009 at the BJJ School, one of Londons original academies. 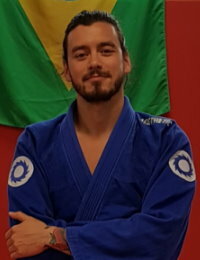 An active competitor at white and blue belt, medalling at numerous domestic tournaments, Simon was rewarded his purple belt from IBJJF co-founder Leão Teixiera in 2012. Soon after he spent 3 years living in South East Asia where he taught, trained and competed across the region while gaining his brown belt. In 2017, after moving back to London, he was rewarded his black belt from 6th Dan BJJ legend, Helio Soneca. A highly technical player, competitor and passionate instructor. Simon is a well-rounded martial artist who combines his BJJ with experience in boxing and judo. Simon takes the Saturday class. Combined they have over 50 years Judo experience and are both 1st Dan (Black Belt) with over 15 years coaching experience of Junior Players. Both have competed as Juniors and understand the complexities / necessities of being a player and coach in this field. Junior Judo is a fun way of actively encouraging exercise in children. It is designed to show technique and perseverance in a controlled way, whilst still being engaging for the child. Each week the child will be learn and complete techniques and put them into practice during "free practice". Children are taught from the age of six years and upwards. Excercise Benefits : A creative form of exercise which is a fun and rewarding. This sport encourages discipline, is character building and improves and maintains both strength and stamina. Kyokushin Karate is taught by Orlando Roach 4th Dan . Orlando has been at the club for more than 30 years teaching and training. Orlando has taken part in Regional, National and International tournaments representing GB. He is the current England Chairman for Kyokushin IKO 1 Karate in England. Alongside the above he is also a member of the management team that help to run the Tokei. 'kara' which means empty and 'te' which means hand. Added with the Japanese 'do' meaning path or way, giving Karate-do or 'empty hand way'. This is an art that uses various parts of the body, through continuous and methodical training, to develop them into powerful weapons that can be effective in defence or attack. The Tokei Dojo has produced accomplished fighters who have fought on the world stage, but above all our goal is to instil in our students the skills of self-defence, physical fitness and mental focus. Pete Kennedy has been instructing in Martial Arts since 1981, he has competed at a National Level for approximately 10 years winning trophies at National and Regional Levels. Pete has instructed over 100 men and women to Black Belt Level and maintains an enthusiasm martial arts and teaching that is second to none. Pete is assisted by Deputy Instructor, Jon Alagoa who is a 2nd Degree Black Belt and Assistant Instructor, Pierre Cochart who is a 1st Degree Black Belt. This class is a high intensity workout aimed at those wishing to be experts in Sanda fighting. The class is performed with music in the background and is open to anyone wishing to improve their kicking, punching, throwing and fitness. The class is aimed at martial artists, and would be martial artists. The class structure follows a six week cycle; each class building on the techniques from the previous. Sparring is not part of this class although shadow boxing and pad work are the key elements. Excercise Benefits : Develops martial artists, and would be martial artists to be expert in sparring and competition fighting. Pete is assisted by Deputy Instructor - Rosa Alvarado who is a 3rd Degree Black Belt and Assistant Instructors - Jon Elam 2nd Degree Black Belt and Shamiso Mushambi 2nd Degree Black Belt. Excercise Benefits : Trains martial artists to be expert; trains beginners to be martial artist. It makes all stronger, fitter, more flexible and more confident. Toby is a 3rd Dan (Black Belt) with over 35 years coaching experience and 45 years of Judo experience. Toby competed at Club, County and Area Level. He is also a former British National Champion spending four years on the British Squad. Judo (The Gentle Art) is based around the skills of throwing and holding your opponent. Within the Senior Syllabus there is also Armlocks and Strangles permitted. Our class also aids in balance, self control and focus of the mind and body. Come down at 8pm on Tuesdays to lock horns! Excercise Level : All abilities from the age of 16 years. Excercise Benefits : This character building sport increases fitness, strength and stamina whislt teaching new skills. Q-ell has been practising Martial Arts for thirty years and teaching Thai Kickboxing for the past two decades. He is also a qualified gym and fitness instructor. Thai Kickboxing is a mixture of circuit exercises and pad striking martial arts training. You will learn striking techniques; kicking, punching, elbow and knee strikes whilst getting fit, allowing you to work out everyday aggressions and unleash your inner Bruce Lee in a safe, fun and friendly environment! Excercise Benefits : Builds fitness and strength. Improves self confidence. Good for balance and flexibility.